Sophie Quire and the Last Storyguard is the second in an apparent series of Peter Nimble books by author Jonathan Auxier. If you haven't read the first one (I had not) there's no need to fret. Although Peter Nimble features heavily in this tale, Sophie is the main character and Peter is more of a sidekick. Auxier weaves Peter's story into Sophie's, providing just enough background to make you want to run out and purchase the first title but not so much that you feel lost by this present tale. I checked out a copy of Sophie Quire from the library and enjoyed it thoroughly precisely because of that. My regular readers are likely familiar with my general discomfort when it comes to checking out books from the library. (Why, you ask? Fees! I can't ever seem to get a book back in time!) In fact, when I went to check out this title and some others, I discovered that my card had expired and there was a little matter of fines. (Sigh.) I used the receipt they gave me as a bookmark so as to better remember when my books are due back! That all explained and squared away, let's get back to my thoughts about this book, shall we? As I said, I liked it because it was a library book. If I were to have bought it, I think I would have been a bit disgruntled by some of the content and would have liked it less. Because it was read on loan, without any (really big) cost to myself, I could relax and enjoy it and that is exactly and precisely what I did. Sophie Quire mends books in her father's bookshop in the town of Bustleburgh. Her mother died when she was but a baby and she lives alone with her father surrounded by what she loves best - books! In the town of Bustleburgh there lives a man named Prigg who desires nothing more than to rid the world of "nonsense" and who is slowly and methodically removing all signs of magic from the land. One of the things Prigg wishes to eradicate is books because books, as anyone can tell you, are magic and therefore "nonsense" and therefore dangerous. Enter: Peter Nimble. He delivers a book to Sophie for her safe keeping entitled The Book of Who. This is one of four magic books (Where, When, and Why being the others). The Book of Who is to be safeguarded by Sophie who is also charged with collecting the four volumes from their hidden locations and bringing them together again. As she discovers, these four book are more magical than most and her attempts to collect and protect involves a great deal of danger. It would appear that her own mother was murdered as a result of these books and one of Sophie's additional missions is to discover who committed the murder. 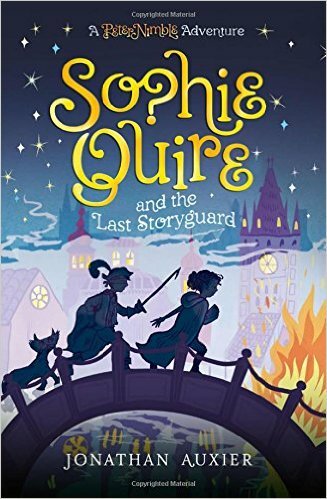 Sophie Quire and the last Storyguard is an adventure story extraordinaire. Auxier has a very engaging writing style which draws his reader into the tale. His sense of humor definitely appealed to me, as did his insights into the world of books, stories, and what makes us love them. This is an altogether fun and imaginative read. Similarly, I have a concern with the character of Madame Eldritch who is a person of suspicious motives throughout the story. It is hard for the reader to tell if she is good or bad but in keeping with modern story telling, Auxier would seem to want us to deduce that bad conduct and bad character can have good intentions and therefore be good. Which, when you think that idea through for about one minute you're forced to come to the conclusion that that can't possibly be correct. Bad character and bad behavior display a person's heart motive and do not in any way express goodness. I will agree with Auxier that someone who "starts off" bad can become good but the becoming involves a great deal of character development with a healthy dose of repentance. Repentance is not a part of the equation with Eldritch so I have a hard time buying the fact that I'm to like her "badness" in order to successfully confuse it with "goodness." Good is not bad, it is good. Bad and good are mutually exclusive and in order to show signs of redemption you can't just have your character do something that you like for sympathetic reasons. Bad is bad because good is good. That's how it works. Sympathy is a bad reason to like bad things. Eldritch's character spends the entirety of the book thwarting the plans of Sophia only to have a slight turnabout at the end which I found utterly unconvincing. Add that to the fact that Eldritch also encourages risqué dress and manners for the express purpose of catching the attention of men, I found her a rather concerning and distasteful influence in my middle grade fiction. As a result of the above two concerns, I won't be handing this title over to my own son who is the right age to be reading this. (This, assuming there is a "right age" to enjoy a piece of middle grade fiction which I don't believe there is.) As an adult, I enjoyed it thoroughly. He can make his own judgement call on this book later but for the present we're going to discourage romantic relationships and suggestions that seduction should be used for manipulation purposes. That being said, I think Auxier is a fun adult read and I fully intend to pick up the first Peter Nimble book to preview for Bookworm1. If that title is a little more free of innuendo and pre-teen romance then I'd love to hand it over to him. "Should you ever be so lucky as to encounter an author in your life, you should shower her or him with gifts and praise." From my review you might assume that I have more negative feelings about this book than positive ones but you would be wrong. I was royally entertained by a terrific storyteller and I offer this book up for the consideration of others who are free to make their own decisions with regards to the issues I've raised. These things which are issues for me might not be issues for you and that is totally fine. As an adult, I found this story extremely entertaining and wonderful. I'd feel remiss if I didn't list my concerns as I think honesty is the best policy, but this does not preclude anyone else (or their children) from full enjoyment of it. Thank you, I'll likely avoid this one for Easton for the same reasons you won't be passing it to J.